Shaw is a quintessential D.C. neighborhood with a ton of history and personality. It’s become known as one of the hippest (or hipster-est) neighborhoods in the city with its new brewpubs, shops, 19th century Victorian row houses, and dog-friendly establishments. Grab a friend (or a pup) and head over to explore what Shaw has to offer. Shaw, is found in downtown D.C., just a stone’s throw away from U Street Corridor, and is one of the most walkable and accessible neighborhoods in the city. There are Metro stops at both U Street and Shaw-Howard on the Green and Yellow lines, and the neighborhood is bordered by the iconic 930 Club to the north and the Convention Center to the south. Shaw’s rich African-American history has not been overshadowed by the craft cocktail bars and hipster shops that have emerged in recent years, as its past has remained essential to its character amid recent gentrification. Blagden Alley is the closest thing to Harry Potter’s Diagonally you can get sans-magic. Blagden is a secret pocket of Shaw with shops, restaurants, and bars strewn about a small system of alleyways behind 9th and N Streets NW. What originally housed horse manure in the 1800s (TMI?) and crack heads in the 1980s has been bippity-boppity-booped into the trendy hidden gem it is today. #FrayLife Tip: Get your cameras and awkward selfie faces ready, Shaw’s Blagden Alley is one of the most Instagrammable spots in DC. 2. Catch a show at the historic Howard Theater and Take in Music History. Sammy Davis Jr., James Brown, The Supremes, and Ella Fitzgerald played here. It’s listed by the DC Preservation League as one of The Most Endangered Places in the District. There are several tasty Ethiopian eateries in Shaw for you to dip your spongy bread into. – Start the morning off at Compass Coffee. The owners hand-picked the very coffee beans that went into your cuppa’ Joe. – Buttercream Bakeshop is the perfect place to satisfy your sweet tooth and take in the tempting scent of baked good fresh out of the oven. The cakes and cookies in the display case are literally edible art. – La Colombe Coffee Roasters is a no-frills industrial-chic coffee shop in Blagden Alley offering french press coffees, draft lattes, and more. #FrayLife Tip: Follow @badwolfdc for the latest openings, events, and other happenings in and around Shaw. – DC9 Nightclub is mostly known for its bar, music venue, and rooftop deck. What you might not know is that they make one of the most astoundingly delicious burgers in the city. – The Bird is a poultry-focused dinner, happy hour, and brunch spot run by carnivore lovers for carnivore lovers. Check out their pork-focused sister restaurant in nearby Logan Circle aptly named The Pig. – Drool. Smoked & Stacked specializes in house-cured pastrami and breakfast sandwiches on milk bread. – Vegetarian? Chercher Ethiopian Restaurant offers plenty of veggie dishes in addition to beef options. – Grab an adult beverage and get your people (and dog)-watching on at the ever-popular Dacha Beer Garden on 7th Street. – Check your the balance in your bank account before going to the Columbia Room. It won Best American Cocktail Bar in 2017 so the bar (and future tab) is set pretty high as far as adult beverages go. Their Tasting Room is ticketed and offers a three-course and five-course menu of inventive pairings of cocktails with small bites. #FrayLife Tip: The Spirits Library and Punch Garden is open seating with a la carte drinks and dishes. – If you love great, local beer, don’t miss stopping by Right Proper. Their production brewery is across town, but the Shaw brewpub is dishing out food that rivals the flavors of their amazing brews. – Keep your eyes peeled for the next installment of PUB (Pop-Up Bar). The Game of Thrones, Miracle on 7th Street, and Cherry Blossom pop-up bars in Shaw are the brainchild of The Drink Company. Their themed bar concepts have become a regular occurance at the 1825 7th Street space for a few years now. The Cherry Blossom Pop-Up Bar returns March 1. – Get your animal fix at Shaw Dog Park by watching the puppers and doggos frolic in this spacious play area just a few blocks from dog-friendly beer garden Dacha on 7th Street. – Catch a show at DC9 if you can. Check out their music calendar here. – Get your shopping on at Lettie Gooch an independent local boutique focused on women’s clothing featuring emerging designers, or Salt & Sundry, where you’ll find a collection of goods for your home including handcrafted furniture, dinnerware, linens, covetable vintage finds, and craft cocktail ingredients. – The African-American Civil War Memorial in Shaw commemorates the service of 220,000 soldiers who fought for the Union in the Civil War. It’s at the eastern entrance of the U Street metro stop. What is your favorite place to eat/drink or thing to do in Shaw? Leave a comment letting us know what we need to add. Want another amazing neighborhood to explore? 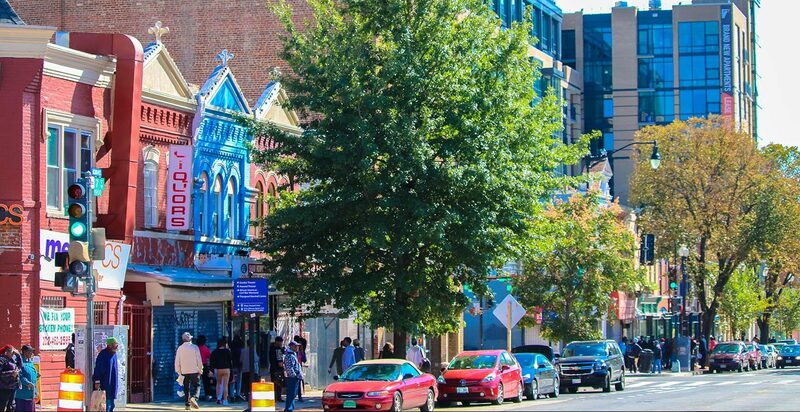 Check out the #FrayLife Neighborhood Guide to H Street.